Aerodynamic design is easy for you to throw and for your pup to fetch, while the center hole allows for smooth, off the ground pickups, a stable, fast flight and a gradual descent. 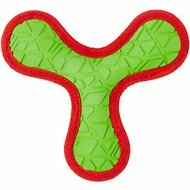 Measures 8" wide with an air-injected center so this Zogoflex Air toy flies higher and is fun to fetch on land or in water. It’s easy to sanitize Zogoflex Air at home — just pop it on the top shelf of your dishwasher. 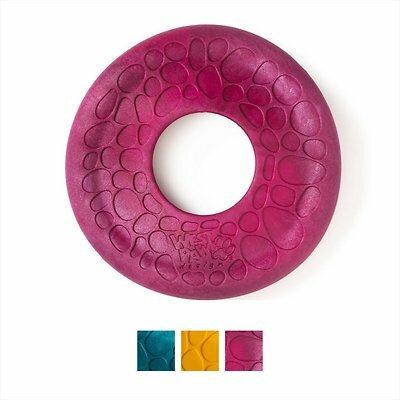 Zogoflex Air toys are completely non-toxic, BPA-free, phthalate-free, latex-free and FDA compliant. 100% recyclable toy is not only eco-friendly but designed, sourced and made in the USA. Only frisbee I'll buy for my Pack! Two big dogs that are hard to find something they can play with and don't tear up!!! They love it cause it is easy to carry and they play tug and it hasn't yet to be destroyed!! Just said to someone, finally the best toy yet!!! 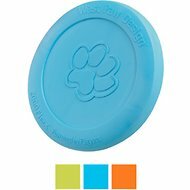 It’s very durable the dogs don’t rip it apart but it’s a little to thick so it doesn’t fly that well. I love this frisbee, Bailey, is 10 months old and loves to chew! It's easy to throw, if she doesn't bring it right back I don't have to worry that she will destroy it. 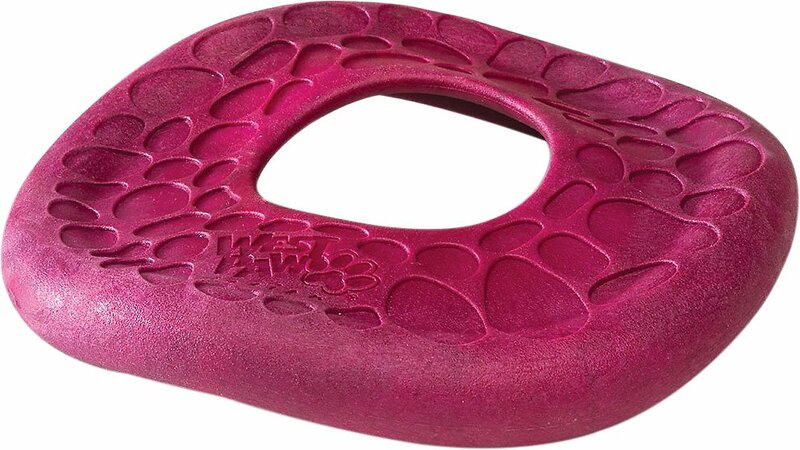 This is a wonderful exercise toy! Our little guy loves his frisbees! However, their life expectancy is only a couple weeks. He's power chewer and likes to taco (fold) them and shake them till they're dead! This one is stronger and since it doesn't have a center, it's almost impossible for him to taco. This one will definatley last a while! He hasn't destroyed it! YES! This seems heavy-duty and my dog likes to chew on it.... but as far as the toy actually flying. Not so much. It’s very heavy and feels more like you’re just throwing a slightly more aerodynamic dog bone. I thought this would be a sturdy frisby, but good option for playing catch. It’s so heavy my dog doesn’t want to catch it, and she is not a small dog, 48lbs I would not recommend it. I thought it would be softer. Seems too hard and heavy. Doesn't really fly very well. Maybe when my pup gets older and wants to chew on something harder. We still love Chewy.